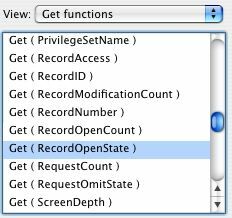 2 - if this is a previously created record and the current user is currently modifying the data within that record or they simply have their cursor in one of its fields. This function is not network aware, it will not tell you if another user has a record opened or not. 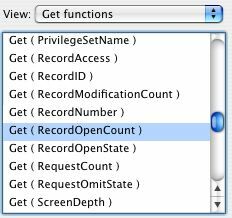 The Get(RecordOpenCount) function will return a count of the number of open / uncommitted records in the current found set. Personally, I had troubles getting this function to work for me but I eventually did. I had tried using an unstored calculation field on the layout but that would not work. I tried multiple open windows with unsaved changes. That did not work as well, which bummed me out because I thought this would be a good way to see if multiple unstored record windows could be tracked. So, this function is dependent upon the current foremost open window. I resorted to using the Data Viewer (a FileMaker Advanced feature). Then I started to get some results. I would modify one record in a portal and the counter would jump to 2. This includes the parent record and the portal record. I updated another portal record and the counter in the Data Viewer went to 3. This means the other portal record change is still open. I worked my way through 5 portal records and the sequence remained true. Then I did the revert command, the counter quickly went to zero and the changes in my portal records reverted as well.